In the second round hosted by Richmond Ashcombe beat Boswells 2-1, lost to Richmond 2-1 and also lost to Malory 2-1 bu got through to the last 8 competition with a much letter points difference. 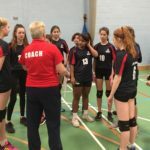 Ashcombe had a great first round in the 2017-18 Under 16 competition beating Polonia, Malory and Graveney Eagles And Richmond B 2-0. 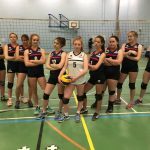 The last 8’s was held at The National Volleyball Centre,Kettering on Sunday 12th March 2017. The second round of the 2016-17 National Under 16 championships was hosted by Black Country on Saturday 21st January 2017. 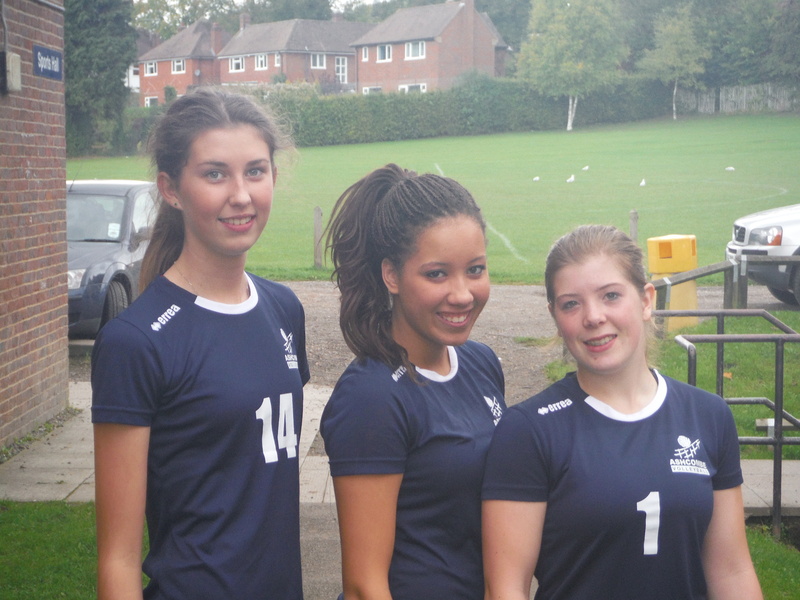 Ashcombe showed the great improvements they have made by again beating all opposition 2-0. 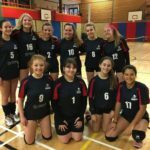 Tendring, Black Country A and Black Country B were strong opposition but Ashcombe swept them all before them with the whole squad playing a role in the victories. 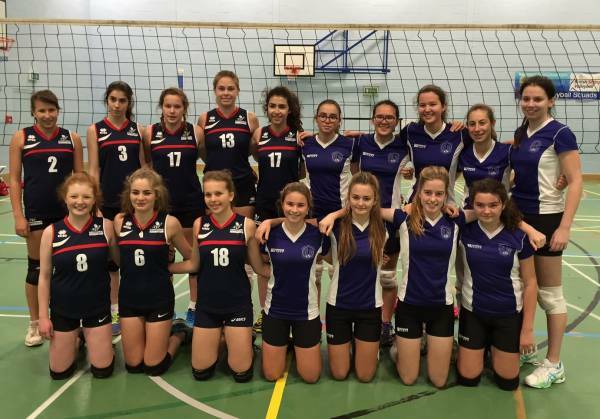 The first round of the 2015-16 National Under 16 championships was held at Ashcombe VC on Saturday 21st November 2015 . Polonia pulled out at the last minute to make it a single match to find the team to go through to the next round. The first set was dominated by Dasha Zavylova with her jump float serves causing all sorts of problems to Putney. 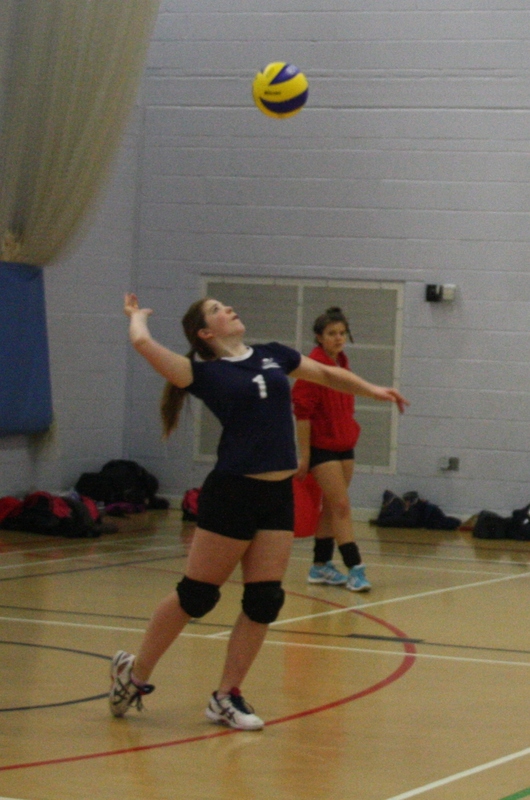 Zavylova served 22 consecutive points to allow Ashcombe to win the set 25-2. 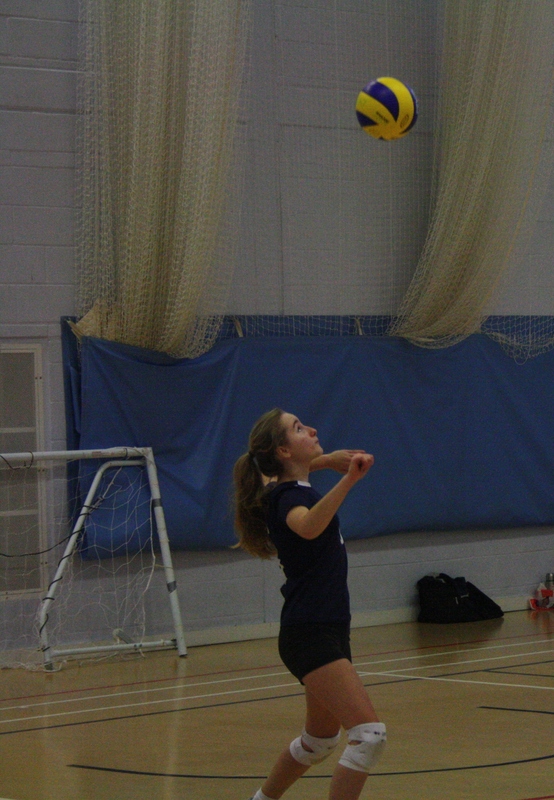 The next set was closer with Putney putting together some controlled attacks but Issie Russell and Ilona McDonald dominated at the net and in serve and Ashcombe took the set 25-20 and the match 2-0. Ashcombe now progress to the last 16 competition where they must travel to Taunton to play Taunton, Beach Academy [Croyde] and Boswells [Essex] on Saturday 16th January. Ashcombe Volleyball Club’s Under 16 team played in the first round of the Volleyball England National Cup competition on Saturday 22nd November and finished third. 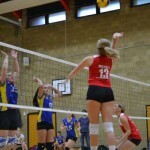 Their first match was against Wessex who began strongly with hard serving which proved difficult for the young Ashcombe team to repel and the Dorset side soon took a 5-1 advantage. Sophie Bushe produced some excellent setting finding her hitters however service errors would prove costly to Ashcombe. 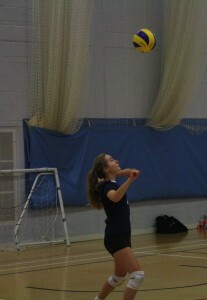 Despite the deficit, Captain Freya McDonald was determined not to gift the opposition anything with some excellent work in defence and as a setter in front court. Wessex won the first set 25-13. Molly Fownes-Walpole produced some quality serving which was ably backed up by McDonald’s defence once again in the second set. 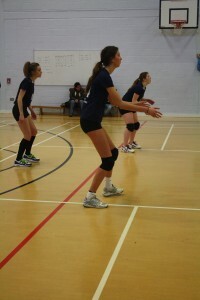 Ashcombe struggled to return some well placed hitting as Wessex worked them round the court to win the second set 25-16. The second match of the day for the Ashcombe Under 16 team was against St Thomas More Lynx from London who are part of the Tottenham Hotspur Football Club Sports development project. 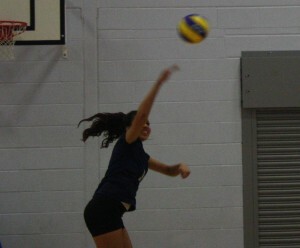 The game was close throughout but was decided by consistent and powerful serving by the Lynx team. The Ashcombe team were led with aplomb by McDonald who showed the way with consistent passing and setting once again. Fownes-Walpole, Emily Hill and Sophie Bushe all showed promise in attack while Gillian Quinn and Laura Trewerne defended confidently. 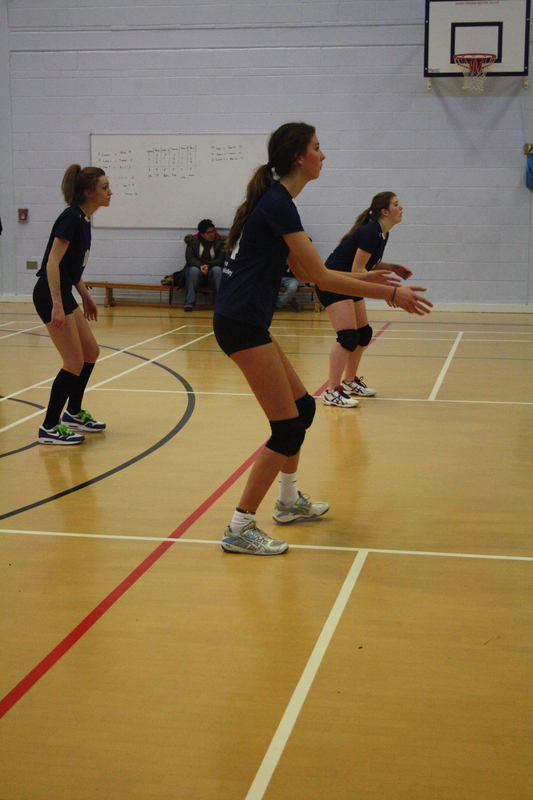 The final game for Ashcombe was against Team Southampton. McDonald again came to the fore by serving several aces to take the first set 25-18. Middle’s Fownes-Walpole and Hill found their confidence at the net and spiked and blocked consistently to win the second set 25-19 and the match. This meant Ashcombe finished third overall. Coach Freda Bussey was pleased with the performance shown by the girls and commented that she hoped the team had used the the competition as a learning experience which they could use in their upcoming matches. 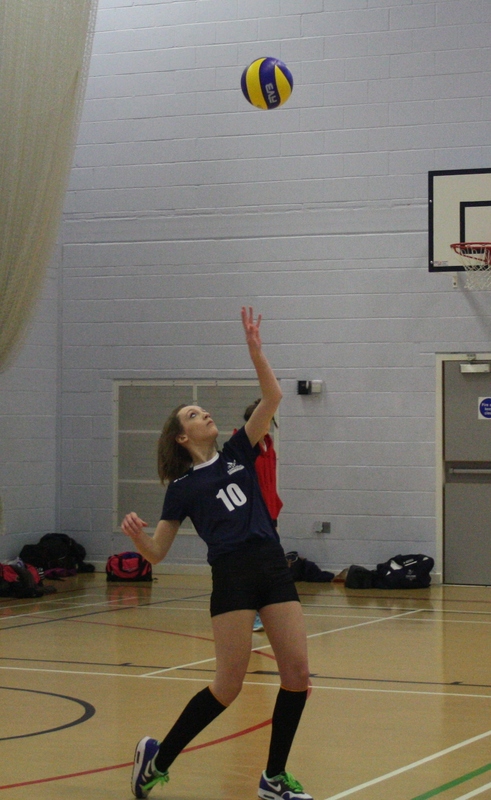 Ashcombe faced Haughton VC, Ashfield Vipers and eventual winners Graveney Malory Eagles in their pool at the Last 8 Competition. The team did not play their best and could not settle into the rhythm that took them into the Last 8 competition in Bournemouth back in January. 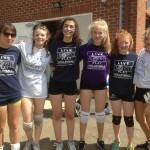 This has been a valuable learning curve for the Ashcombe team and they hope to come back next year stronger and wiser. 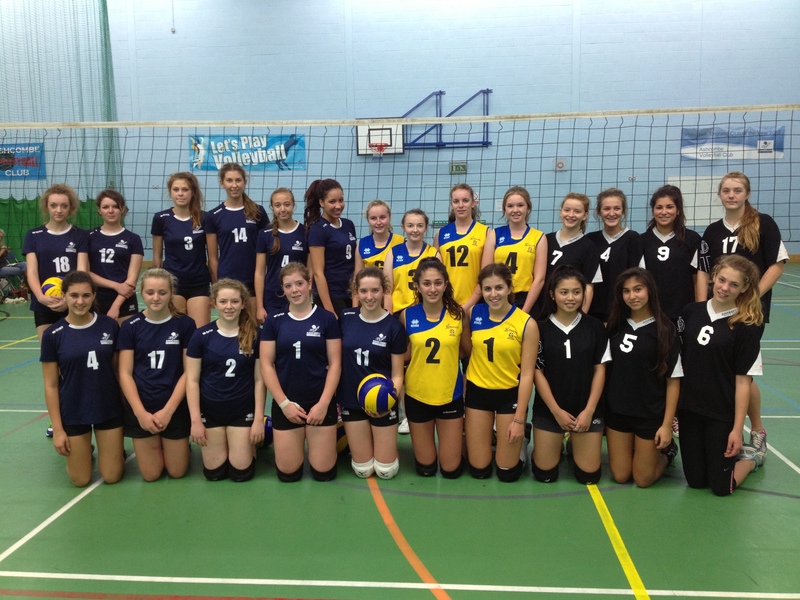 Ashcombe Volleyball Club’s Under 16 Girls team traveled to Newbury for the first round of the Volleyball England National Under 16 competition on Saturday 30th November 2013. 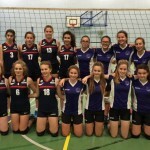 Their first game was against Taunton Volleyball Club and although Ashcombe won 2-0 they were made to fight for every point against a very tall and well drilled Devon side coached by ex-international Jurek Jankowski. 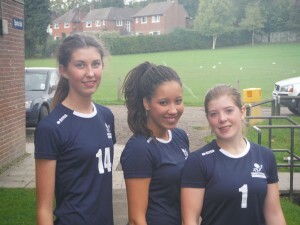 In their second game, against home team Newbury, Ashcombe made quick work of the inexperienced side and again won 2-0. Katy Begley, Asia Perkins and Ailsa McDonald were all dominant with service and won several points each with ace serving. In the final game of the day Ashcombe faced Academy of Beach Sports, Croyde who had also won both their previous games to set up a showdown for top spot . Service and serve receive by both teams was a determining factor and the jump serves from the Croyde team kept them in the lead winning the first set 25-13. Rachel Higgins and Maddy Nutt showed great determination in defense with strong blocks and accurate passing but the team from Croyde continued to attack with jump serves and strong spiking and thus took the second set with the same score 25-23. 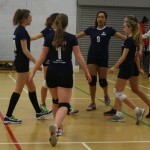 Coach Freda Bussey will be working with the team to strengthen serves and service receive before the next competition. 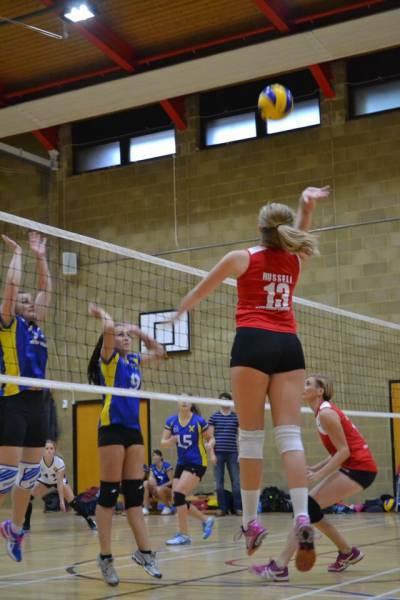 Ashcombe VC and Academy of Beach Sports both go through to the second round to be played at Wessex in Bournemouth on Saturday 18th January 2014. 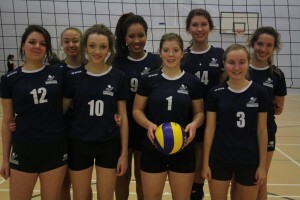 Ashcombe team: Edie Adams, Katy Begley, Lydia Goodwin, Rachel Higgins, Ailsa McDonald, Maddy Nutt, Asia Perkins, Paige Watts . Coach: Freda Bussey MBE. Ashcombe will travel to Newbury to face Taunton Juniors, Newbury and Academy of Beach Sports in the first round of the Under 16 Cup on Saturday 30th November 2013. The top 2 teams from this tournament will face Wessex [Bournemouth] in the second round which will be held in Bournemouth on Saturday 18th January 2014. 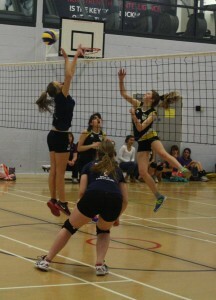 Pictured below: Katy Begley, Lydia Goodwin and Rachel Higgins three members of Ashcombe’s Under 16 squad who have been selected for the England Cadet squad. 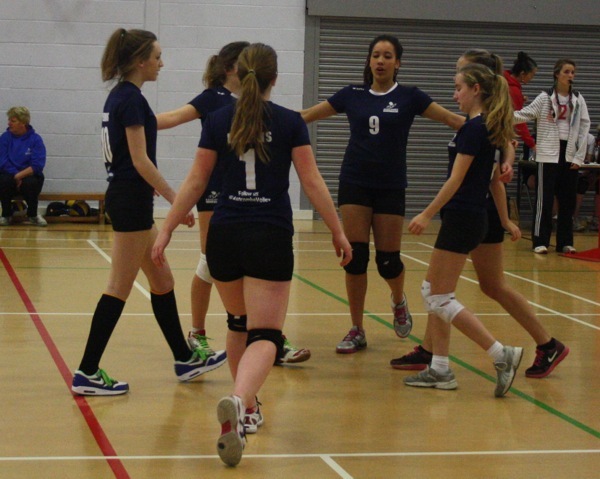 Ashcombe Dorking 1 Under 16 girls team beat South East Select, Ashcombe Dorking 2 and Epsom Volleyball Club in a tournament held at Ashcombe Volleyball Centre on Saturday 5th October. 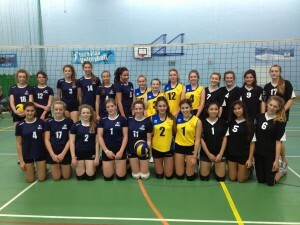 In a close fought final match Ashcombe beat the South East Select team 2-1 with the final set reaching 16-14. 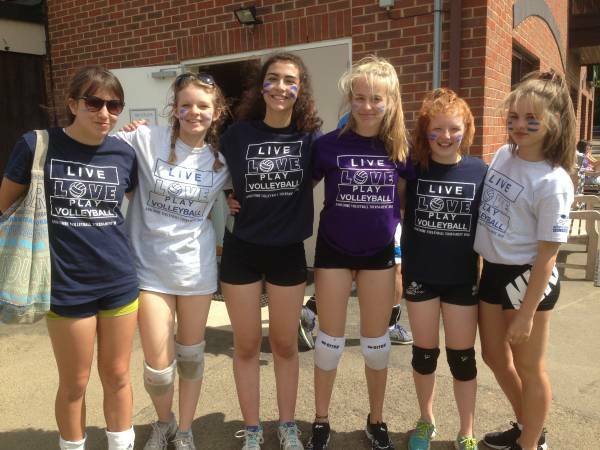 Katy Begley, Rachel Higgins, Ailsa McDonald, Lydia Goodwin, Asia Perkins, Maddy Nutt and Paige Watts.